In Ohio, The Telegram reports that while traveling State Route 93 between Jackson and Oak Hill, you can catch a glimpse of a quilt square hanging on a barn that was 100 years in the making. 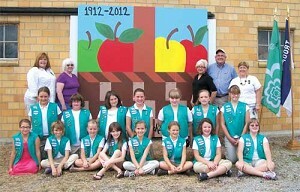 In celebration of the centennial anniversary of Girl Scouting, Junior Troop No. 406 of Jackson spent Sunday afternoon, September 9, decorating a prominent barn located just south of Jackson. The local scouts hung a barn quilt pattern, comprised of two 4x8-foot wooden sheets, on the barn of Steve and Fritzie Pritchett. The barn has been owned by the Pritchetts since 1932. The colorful pattern features a basket filled with red, green, and yellow apples. The names of each of the girl scouts in the troop are written on the bottom half of the display. Additionally, the dates 1912 and 2012 are painted across the upper left-hand corner. The idea to hang the commemorative barn quilts, a project dubbed "Stitching Together," originated from the Ohio's Heartland Girl Scout Council, which envisioned at least one such barn quilt in every county. The local scouts of Troop 406, which is comprised of mostly 3rd and 4th graders, followed through. A ceremony was held in conjunction with the hanging of the quilt on the barn. It was attended by community members, girl scout officials and former scouts. The troop is also currently working on its Bronze Award, which is the highest possible award for its age group. The community service project the troop chose involves preparing care packages for foster children.